The wind started blowing over the Sierras just right today and we got the wave were were hoping for. 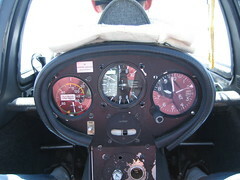 I had an early flight in the Pegasus, which I hadn't flown in about a year. I managed to eventually thermal up to 10,500 feet after I spotted a pair of dust devils merging. I hit the bottom of the secondary wave a few times but never got up in it. So I tried pushing into the primary but ended up in the rotor. 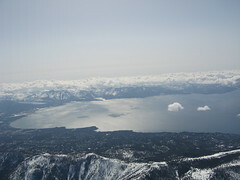 And here's one of many pictures I took of Lake Tahoe from above 17,000 feet. We flew down south to Alpine and then north to Reno and I-80. Of course, we screwed around in a few other places too. I'll put the full sized images on Flickr when the trip is over.